**Whenever my grandchildren visit Arizona, we go out in the golf cart after dinner and look for bunnies. The children maintain a bunny book where nightly bunny totals are recorded. There is a column for “Ciyotes” which was edited this year to include bobcats. My first “diabetes in the wild” encounter happened when my next door neighbor came to talk to me about a tree issue affecting both of our yards. She and her husband are part-time Arizona visitors because he still works full time. We’ve always been friendly but have never talked about much except the weather and grandchildren. Sylvia indicated that Jim wasn’t there yet because he was traveling for work. I knew that he was affiliated with a major university in their home state but had never asked for more details. I asked Sylvia about Jim’s profession and she said that he was a teaching professor and practicing physician in the speciality of…. Wait for it! ….Endocrinology! So for 8-9 years my Type 1 diabetes of 40 years and I have spent the winter months next door to a renowned specialist in diabetes. Similarly he has unknowingly lived next door to a not-so-renown diabetes blogger! It rained the next couple of days and before I knew it, Jim and Sylvia had left and I didn’t see them again before I returned to Minnesota. Thus I never got to have a celebrity-crush visit with the neighborhood diabetes doctor. I Googled him and learned that he is quite renown on a national basis. I didn’t get a chance to give him one of my blog business cards and I have no idea whether he ever reads patient blogs. 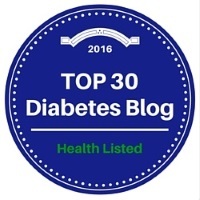 My own endocrinologist avoids diabetes social media and does not read the blogs of her patients. On one hand I think doctors benefit from hearing patient voices; on the other hand I know my endo works long hours with insufficient pay and I don’t expect diabetes to be her hobby. If Dr. Jim chooses to read any of my blog, he will learn that I am an educated and involved patient who does her homework and improvises with “her own thing.” It will be up to interpretation whether he sees me as an empowered consumer or a nightmare patient…. I went to my Arizona community gym a few days before returning to Minnesota. A man about my age was the only other person there. We said “Hi” and continued with our workouts. After about 15 minutes, he introduced himself as “Tony” and asked about the Dexcom transmitter on my arm: “Hey, is that thing on your arm for diabetes?” I said yes and indicated that it was a continuous glucose monitor and described what it did. He told me that a year ago he had started working out and changing his diet to try to avoid diabetes which runs rampant in his family. He had lost 43 pounds, gained muscle, and felt energized by his new level of fitness. His doctor was thrilled with the effect on his lab work. I don’t think that Tony had been diagnosed with pre-diabetes but hopefully his hard work will prevent or at least delay diabetes coming into his life. A bit teary-eyed he told me that she had died six months ago after 60 years of marriage. He was an engineer by trade and had always helped her take care of her diabetes. She wasn’t good with numbers he explained. She used a pump and CGM which I assume were Medtronic because he said that her “thing” didn’t look like mine. It turns out that Morrie lives next door to one of my friends so I plan on looking him up next year when I’m back in Arizona. I would enjoy hearing more of his story as a caregiver and more about his wife’s journey with diabetes. Morrie indicated that he hadn’t been getting out much since his wife died and how much he enjoyed talking with me. The enjoyment was mutual, but tinged with sadness. Poppies, bobcats, and diabetes. Wild things.